If you’re like most of us, you’re surrounded by electrical and electronic goods that quickly go out of date or fashion. And what happens then? Our homes and businesses pile up with unwanted items creating clutter. 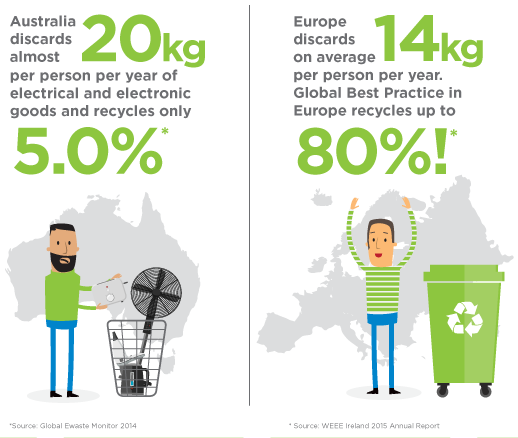 Australians discard millions of electrical and electronic goods every year – from large appliances like fridges and washing machines, to small appliances like toasters, kettles and vacuum cleaners, to entertainment equipment like mp3 players and stereos, as well as electrical tools and gadgets like drills and hairdryers. Add to this the tonnes of old printers, computers, monitors, copiers and TVs, and millions of mobile phones that no longer work! All you need to do is drive down any street to see the number of unwanted electrical and electronic goods discarded on footpaths. This collective mountain of unwanted electrical and electronic goods is an exponentially growing challenge that is harming our environment. There is a need to ensure these goods are properly collected and recycled, due to the toxic and hazardous materials like lead, mercury, cadmium and brominated fire retardants. And when they go to landfill, they cause soil and water contamination that is harmful to our environment. What’s more, the vast majority – up to 95% – of the materials in these goods can be reused or recycled.